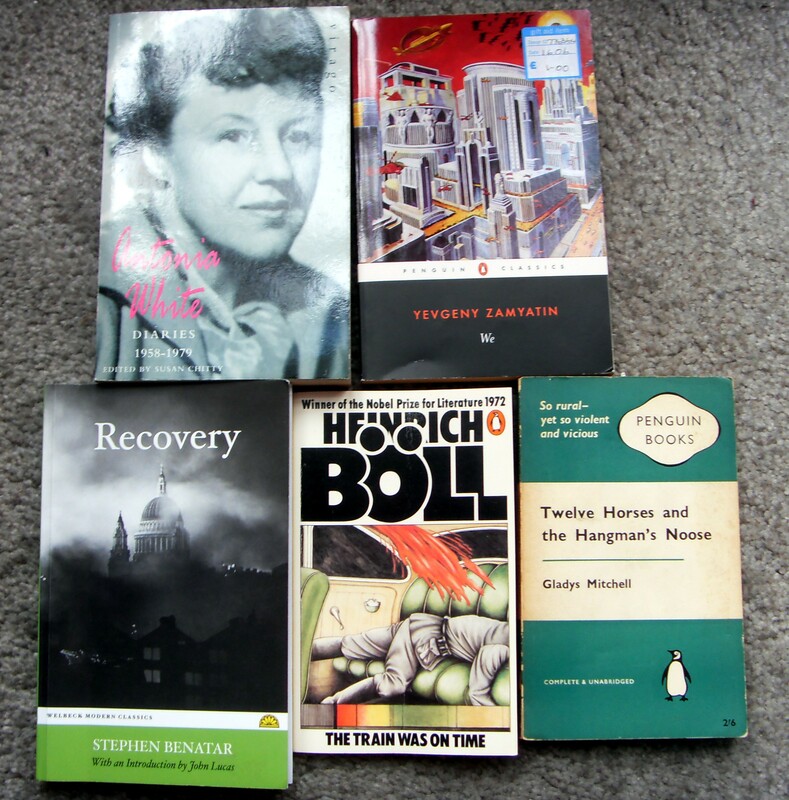 Christmas reading – from magazines to academia…! I always hope to get a lot of reading done over the Christmas period, but what with family visits and the like it never seems to happen… I decided not to aim for too much this year, but I’ve ended up spending time with an oddly disparate range of reading material! I picked up the London Review of Books whilst collecting one of the Offspring from the railway station for their Christmas visit; I was early and had rather foolishly forgotten to bring a book!! And needing something to keep me company with my coffee, this was the obvious choice. The review of the Gorbachev book alone is excellent reading – I obviously need to buy this more often. As for The Happy Reader, I’ve been contemplating subscribing for ages, and the fact that this issue had much content on Zamyatin’s “We” tipped the scales. Fascinating stuff. The top book is a lovely volume from Notting Hill Editions which I’ll be covering for Shiny New Books in the new year, so look out for that. I’ve been waiting for the new edition of “The Devils” to come out, as it’s a Dosty I haven’t read – and it’s a chunkster, so I may start 2018 going down the rabbit hole of another big book! The Turgenev was an unexpected bonus, and I’m keen to read this too after looking at the description. Given my love of Russian literature, it’s obvious that I’d be looking for any titles from our year of 1924 from authors from that country. Oddly – or perhaps not oddly – there aren’t really that many. Bearing in mind that the post-revolutionary civil war only ended in 1922, it would perhaps be too much to expect great works of Russian literature to have been published in the 1920s. And yet there were several – notably Bulgakov, whose “The White Guard”, “Heart of a Dog” and “The Fatal Eggs” are all from that era, though none were published in 1924. 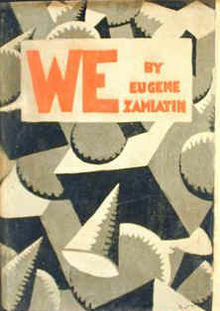 However, one seminal work from the Soviet era *was” published in 1924, and that’s Zamyatin’s “We”. A dystopian novel set in a future police state, it’s set in One State, an urban landscape built almost completely in glass. This enables citizens to be constantly spied on by the secret police and spies, enforcing a collective consciousness from which there’s no escape. The characters have numbers not names – our main protagonist is D-503, a spacecraft engineer – and people wear identical clothing in a society that is mechanised not only in a technological way, but also in the way it controls the populace. D-503 is helping to build a space ship; however, an encounter with a woman called O-90 sends his life off-trajectory, and he discovers that not all people behave in the same way as him; he discovers part of the planet is not like One State; and his comfortable, if restrictive, mindset and life is shattered forever. I’m not going to say too much more about the plot because a. I’d like you to read the book itself and b. I read the book pre-blog so I don’t have a review to point you to and I’ve not had the time to re-read! However, “We” is known for its influence on later writers, in particular Orwell’s “Nineteen Eighty-Four” (a fact that George himself acknowledged). Elements such as the relationship with a woman and a discovery of a different way of life will be familiar to readers of Orwell’s great novel, although both books have different foci and different strengths. And Orwell himself was of the opinion that “We” influenced “Brave New World”; additionally Nabokov was reading “We” while he wrote “Invitation to a Beheading”. So it’s a book of great import. “We” was of course subject to censorship, and eventually reached publication in 1924. 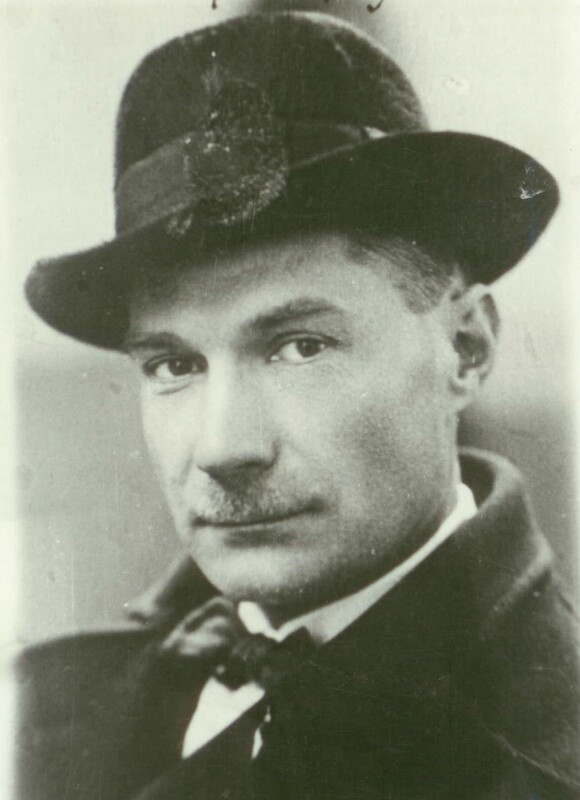 However, Zamyatin’s position after publication became more and more precarious, and he was eventually allowed to leave the Soviet Union in 1931 when he moved to Paris. He died there in poverty in 1937, having produced an influential piece of work which had an incredible influence on later writers. I have three copies of “We” – predictably enough, as I often seem to have multiple copies of books I like and which are in translation. I originally read the book as a fragile Penguin Modern Classic some years ago, and found it complex and gripping; it’s translated by Bernard Guilbert Guerney, an American translator whose name has turned up a number of times recently on books I’ve been gathering, and the introduction is by Michael Glenny. That copy went walkabout a while back (I have a sneaking suspicion I loaned it to Eldest Child for his degree course and never saw it again). However, I picked up a duplicate copy, plus also a more modern Penguin just because I liked the cover – this one translated by Clarence Brown, who also edited the Portable Twentieth Century Russian Reader. The most recent version is the lovely Hesperus Press volume translated by Hugh Aplin, which I intend to re-read one day. In the meantime, I’d encourage anyone who loves speculative fiction and something inventive and unusual to give “We” a try – it’s very thought-provoking, and a great advert for 1924! and I have perfectly good reasons for buying them all!! The Antonia White diaries is a Virago – which is reason enough, particularly as her “Frost in May” has the honour of being the first VMC! ‘Nuff said. “Recovery” by Stephen Benatar sounded intriguing – Benatar himself sounds intriguing! Plus I have his “Wish Her Safe At Home” on Mount TBR and this can keep it company. And it’s signed by the author too! “Twelve Horses….” is by Gladys Mitchell and it’s a vintage green crime Penguin, so once again that’s a no-brainer – there’s no way it was going to stay on the Oxfam shelf. 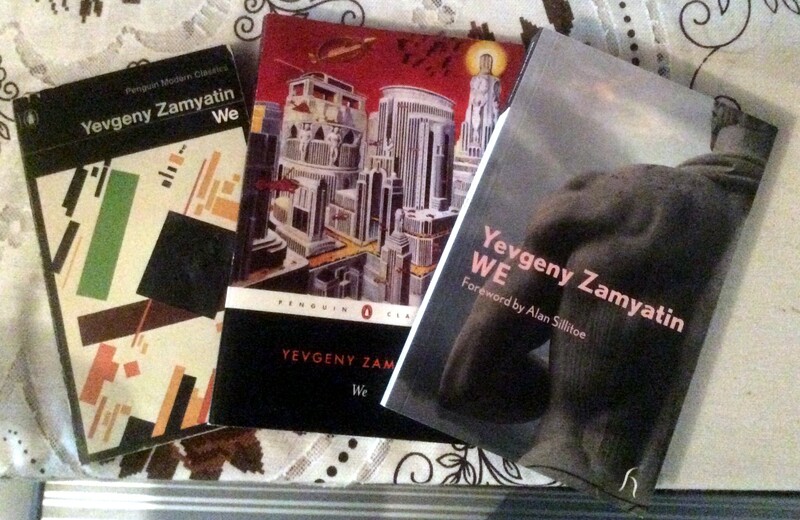 Zamyatin’s “We” – well, of course, I already have two other editions of this book. But I owned this particular edition with its lovely cover once and loaned it to Eldest Child for a university module. I don’t recall seeing it since…. so of course felt the need to replace it. And lastly Heinrich Boll – an author I’ve never read, although since he’s a Nobel winner I should have. This is his first novel and it’s short too – so I was intrigued enough to try it. Now for some painful violence on the shelves…..